GUIDE | Where To Find Creepy Treats To Spook Up Your Taste Buds This Halloween - EAT WITH HOP! Some places are so creative with coming up with Halloween themed food! Here are a few that I discovered and wanted to share with you all. I hope you get excited just as much as I am about these Halloween treats! If you know of any more places doing something spooky, let me know! For Halloween, American Tea Room is serving up a drink called the Scary Terere. This is a matcha terere (matcha + orange juice) with activated charcoal added and a gummy eyeball for some creepiness! Available now! 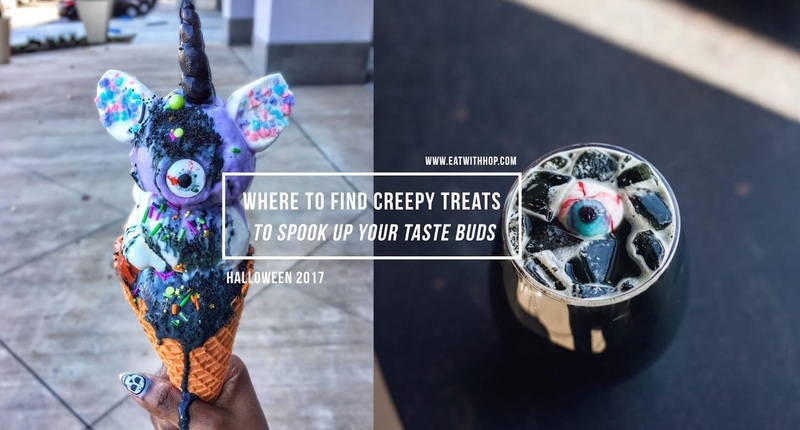 The Moo Gelato, located near Golden West College, is adding some scary twists to their desserts! They have spooky ice cream, milkshakes, cupcakes, and more available! This is currently available! Do you dare drink hot cheetos? Try the Hot Cheetos Frappuccino if you are brave enough! Available only from Oct. 26 to Oct. 31. Chipotle used to give out free burritos if you showed up in a costume on Halloween. Unfortunately, those traditions are gone... but they still have a deal this year. On Halloween, wear a costume and your burrito is only $3! That's still saving a few bucks! Honey and Butter is one of those must-go places if you love quality tasting macarons, made with lots of love. And, the way they make their character macarons are so on point. For Halloween, Honey and Butter will be making Stranger Things themed character macarons (Oct. 31 only). The Loop Churros is known for their aesthetic loop shaped churros. For Halloween season, the dessert parlor is serving up Halloween Night Black Pumpkin Spice Churro on a Vanilla and Charcoal Tiramisu swirl soft serve and Char-Chata (charcoal + horchata) drinks. Currently available! Instead of serving anything blue for the Halloween season, this place is serving BLACK chia as a base for their healthy bowls. Specifically, chilled charcoal chia pudding. Is this as black as your soul yet? Currently available and might even be kept on the menu! Pancakes anyone? On Halloween day, kids can get a scary face pancake for free on from 7am - 10pm. (Kids 12 and under only). Salt and Straw is known for pushing the envelop when it comes to creative flavors. Their new Halloween themed flavor is sure to bring tingles to your spine. Their Creepy Crawly Critters, is literally that. Matcha ice cream + spiked with zesty orange, hiding real dark chocolate-covered crickets and coconut toffee-brittle mealworms. Who dares to try this!? Currently available till Halloween! Creme and Sugar is known creating colorful sugary treats! This Halloween season, they are serving spooky themed lattes! Check it out! (Buena Park location only) Snow Station serves shaved snow in a spooky way this season with their R.I.P. SNOW! Currently available till Halloween. Photo Credit | E.P. and L.P. Seriously, one of the best Halloween themed meals yet, E.P. 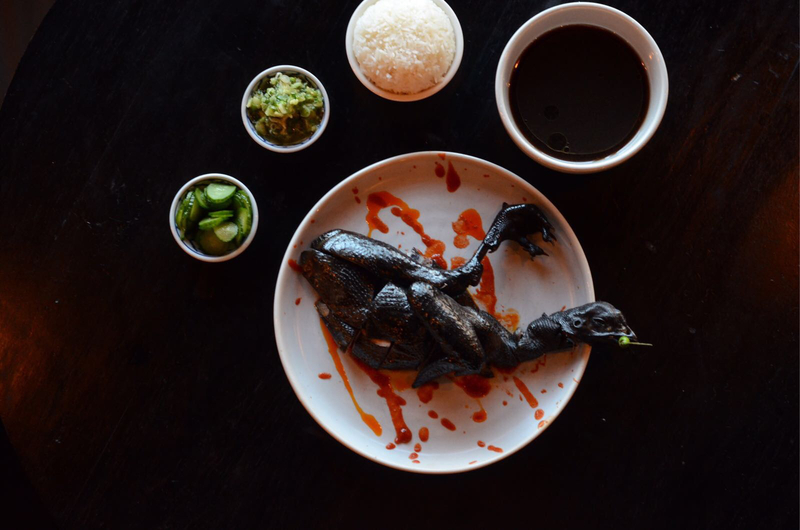 and L.P., a restaurant located in West Hollywood, concocted a chicken dish called the Ghoulish Chicken. Available Oct. 26 - Oct. 31, 2017. Halloween cupcakes are here at A Piece of Cake Hanh Phuc bakery located in Westminster (same plaza as The Loop Churros)! Would you dare eating a cupcake topped with shards of glass? What about bats and eyeballs? Ghosts too? These treats are available now! You can get the Zombie Frappuccino October 26 - 31, 2017 at participating locations. This Halloween-themed drink is made with green caramel apple, a drizzle of dark mocha, and pinkish whip! Do you know of any other spooky themed treats that I missed and should include? 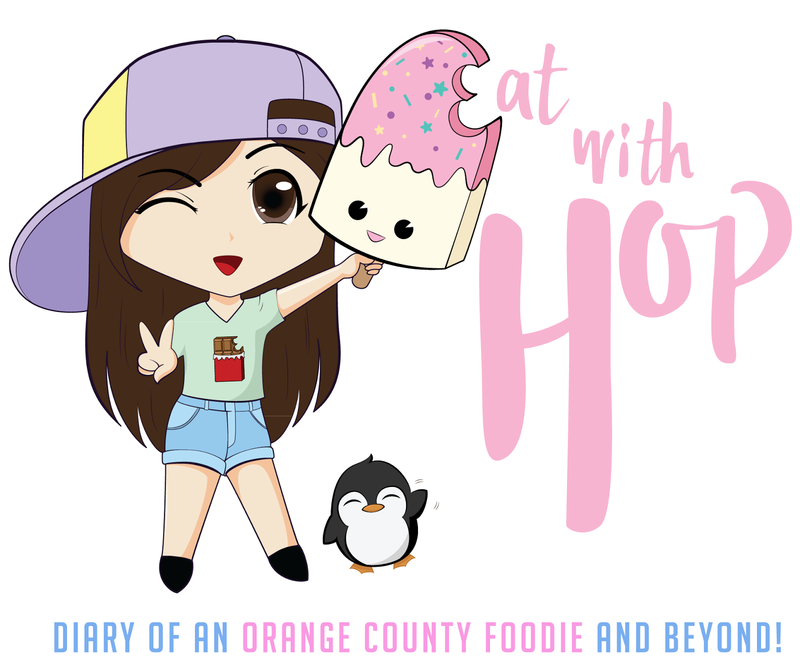 Drop me a line and e-mail me at GetHungry@EatWithHop.com !